WeCraftCards.com • View topic - Saturday - E is for.....Winner is ELAINE! Saturday - E is for.....Winner is ELAINE! Terrie and Golda, I love the blue color scheme on your cards. Elaine, your floral card is lovely. Trudi, your teacup card and envelope is delightful. 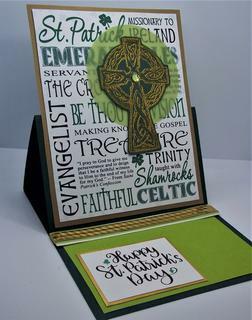 I found a wonderful subway art St. Pats day freebie and just had to build a card around it. Making a matching envelope was the perfect addition. What a great card Kathy! Kathy that is wonderful! I like the green vellum behind your embellishment, it gives it a soft glow. Nicely done. Thank you for playing along this week. 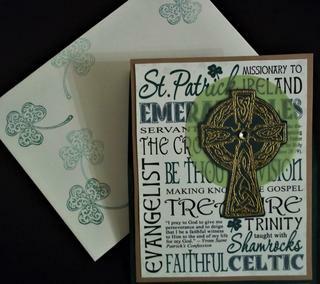 Kathy - what a great St Patrick's day card! You all are simply the best! Thank you again for another fun crop! Thank you Trudi for organizing and for the other crop hosts and to all the participants and to Terrie for the fun game. Small group but a mighty talented group! Woohoo, I love seeing my name in lights! Thank you Barry!